Dr. Hitchcock grew up in Idaho working with his dad in construction. He learned the importance of hard work and the sense of accomplishment that comes with it. However, as is common he saw so many people in his community that had pain and were only being prescribed medication instead of trying to treat the underlying problem. He knew there had to be something more that could be done for pain besides just medication to cover it up. While searching for a better way, he found chiropractic. Dr. Hitchcock attended Brigham Young University of Idaho for his science and anatomy prerequisites and then transferred to the oldest and largest college of chiropractic, Palmer College of Chiropractic in Davenport, Iowa. 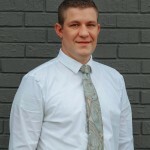 He achieved both his Bachelor of science and his Doctor of Chiropractic at Palmer. Dr. Hitchcock uses the Gonstead and Diversified techniques to help achieve optimal function for the spine and body. The spine is the most important structure of the body, it anchors and supports all the other parts. If the structure of the spine is off than the function of the body is too. Dr. Hitchcock and his wife, Heather have 4 amazing children(2 girls and 2 boys). His family is very active outdoors and they love camping, boating and 4 wheeling. Ready to experience what chiropractic has to offer? Contact us today to schedule your first appointment. We look forward to meeting you!